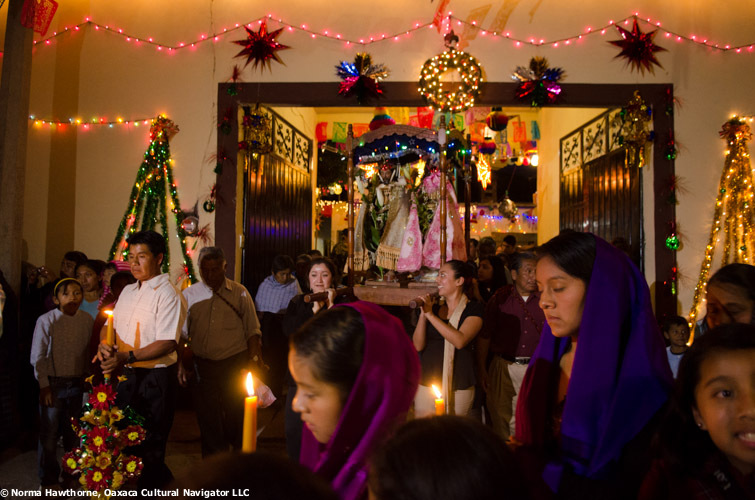 For nine days and nights leading up to Christmas eve, the Zapotec village of Teotitlan del Valle, Oaxaca, Mexico recreates the journey of Joseph and Mary to Bethlehem. 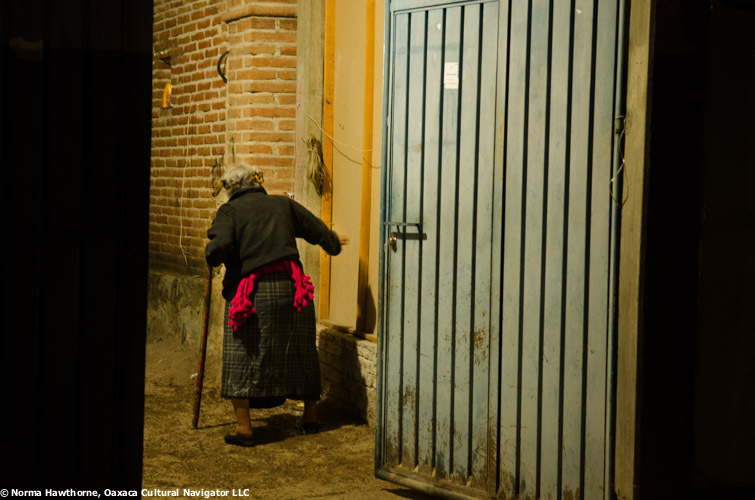 Each night they sleep on the road, which means they arrive at the home of a host family who welcomes them to their courtyard, then altar room, filled with copal incense and prayers. There is a huge feast for invited guests: tamales, roasted beef or pork, homemade tortillas, wild turkey called guacalote. I can smell the charcoal cook fires from a distance. The villagers gather at the front gate. Hosts distribute tamales and atole (women have been cooking for days), men sip beer and mezcal, children blow whistles. The celebration is grand, festive. Then, at around 6:30 p.m. the procession leaves the host home and passes through the streets of village, up hills, through narrow alleyways, from one side to the other, until they come to the home of the next night’s host family and the celebration continues. It is both solemn and celebratory. Women, men and children are selected by each host family to do the honors of leading the procession and light the way with handmade beeswax candles decorated with beeswax flowers, birds, and glittering pendants. Followers cover their heads in scarves as if in church. The men who handle the fireworks and shooting rockets are out in front to guide the way with sight and sound. From all corners of the village we can hear them until late at night, and then again in the morning as a wake up call. I arise at six to the blast of a rocket. Behind the fireworks are the altar boys carrying crosses, then four young women carry the palanquin of Mary and Joseph. 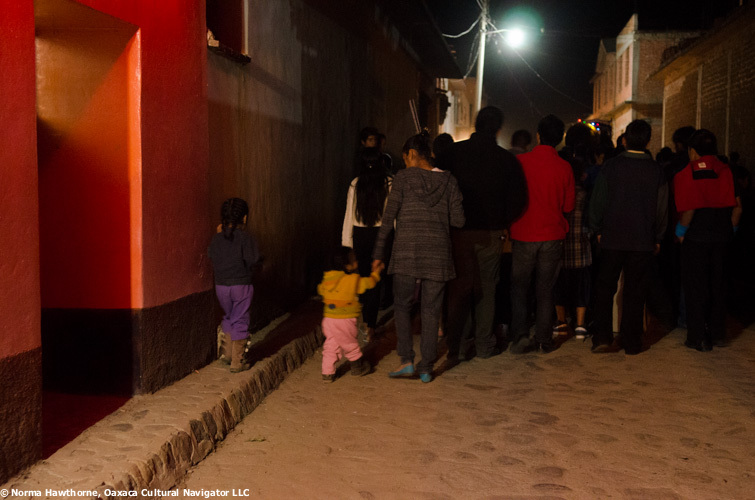 On this night, our procession must have picked up more than 300 people along the way as the route passed through every corner of the village and ended at a home not more than two blocks from the one we had left. Up hill and down, across cobbled streets, we picked our, way careful of potholes and uneven stones and construction materials. The streets were swept clean and watered so there would be no dust for us. We must have walked three miles at a steady shuffle. Those who didn’t process waited in doorways. The older people who had difficulty walking made it part of the way and then dropped off, as did the parents carrying sleeping babes on their shoulders, and holding toddlers by their hands. On the night of December 24, the baby Jesus appears in the altar room of the host family for La Ultima Posada — the last procession. This is the biggest party of them all and it will continue through the night and into the morning. Visitors are welcome to join the procession. You can spend the night at Las Granadas B&B or at Casa Elena, both excellent establishments. You can start out having comida at Las Granadas prepared by Josefina and then end the night with a glass of wine or a cup of mezcal! It is difficult! In the ideal world, one would use a tripod to hold the camera steady, avoid flash, use manual settings on your camera to manipulate the shutter speed, aperture, and film speed/ISO. That means constantly changing settings for various lighting situations. 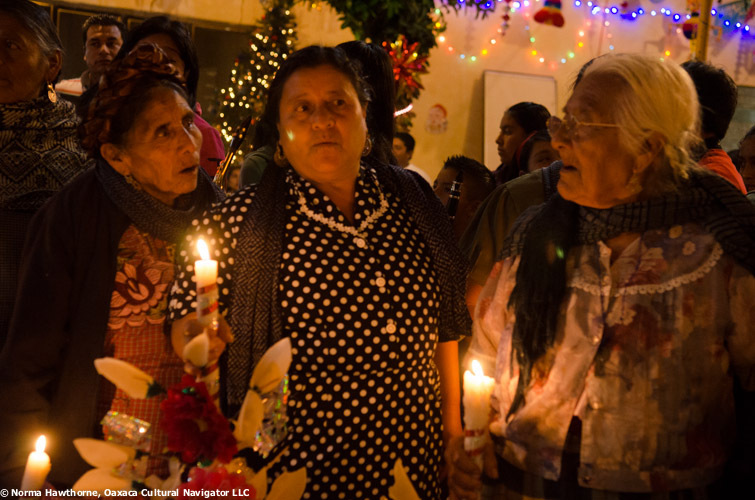 In very dark situations, like during this posada on streets barely illuminated, one gets a golden glow. I also turned off the automatic focus setting on my camera and lens and used manual focus. The lens has a hard time reading light and will not focus otherwise. With my bad eyes and very low light, that meant guessing, which is why many of my photos were blurry. Those you see here have a warm, golden glow typical of low light, night photography using a hand-held camera. I was able to adjust some of the photos using Lightroom photo editing software. 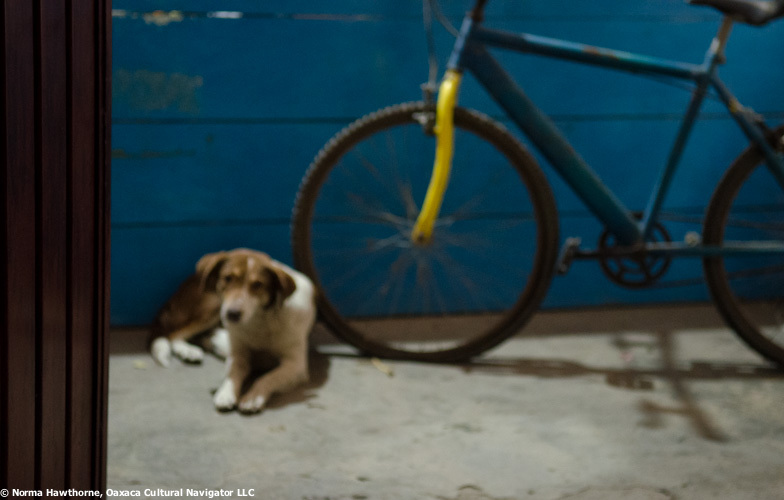 We teach all this in our Oaxaca Cultural Navigator photography workshops. We learn about the camera and immerse ourselves in the indigenous culture, too. Like a writer, a photojournalist captures and tells a story through the still photographs s/he takes that is accompanied by a short written narrative. 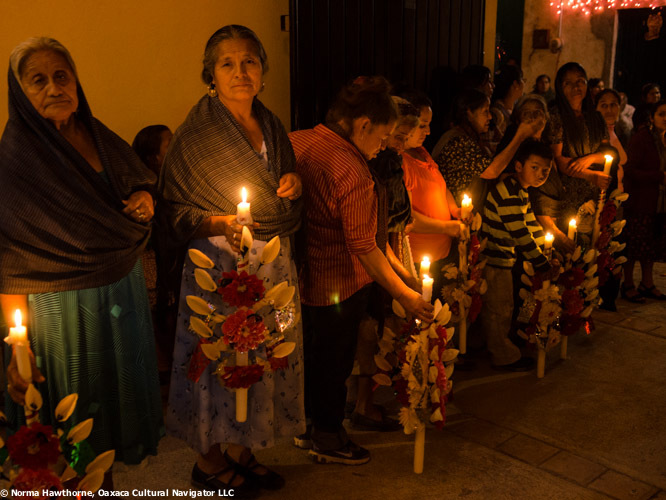 Oaxaca, Mexico, during the extraordinary and magical Christmas season will be our workshop laboratory to discover and record the scenes of the season– Las Cuevitas and Day of the Three Kings (Epiphany). Bring your digital camera (point-and-shoot or DSLRs welcome), your memory cards, your note pad and pen, your imagination and your sense of adventure. We will teach you the techniques for capturing and documenting the culture with your camera and writing about what you see to accompany your photos. 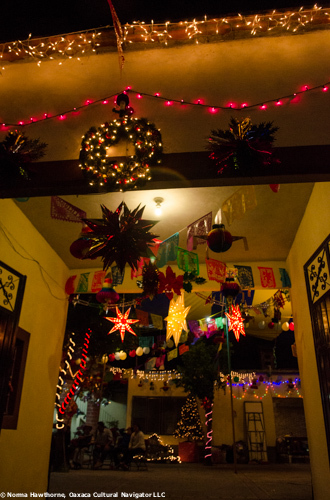 The Christmas holidays in Oaxaca are magical and mystical, vibrant and festive. They are filled with processions, special foods, merrymaking and solemnity. Together, we will discuss the region’s rich history and culture, the art and craft traditions, belief systems and relationships to nature and daily life. We will visit archeological sites and crafts villages. This will inform your photographic work that is anchored with diary entries. January 1 — Our workshop starts with a morning learning session followed by a day trip to the local Tlacolula regional tianguis (market) filled with food, aprons, household goods, crafts, everything and the kitchen sink. All day excursion on local bus includes lunch. January 3 — leave in early morning for a day in craft villages of Arrazola and Atzompa, with visit to renown Mesoamerican archeological site of Monte Alban. Following dinner in the city, return to Teotitlan del Valle. January 4 — Morning learning session followed by weaving and natural dyeing demonstration with Master weaver Federico Chavez Sosa. January 5 — After morning learning session, enjoy a demonstration with artisans who work in natural dyes and handspun and woven silk. Spend the afternoon with a family celebrating Dia de Los Tres Reyes. January 6 — After morning learning session, spend the day on your own to explore, shop or prepare for the evening final presentation and best of week show. 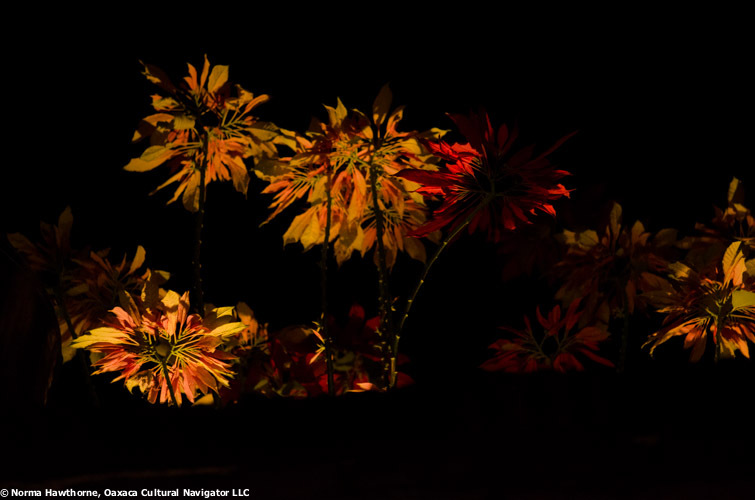 June Finfer, Chicago playwright, documentarian, and photographer will lead you in this learning adventure where you will enter into the world of the Mixtec and Zapotec people. June will share her tips on using your camera to capture the decisive moment, and her writing experience on how to keep a diary of your experience. You will in effect be a photojournalist. The Internet has created many opportunities for amateurs to contribute to the art of photojournalism. Small, portable cameras give each of us the personal power to create stories through images that are publishable on blogs, podcasts and online news magazines. Even traditional media outlets welcome photographs from amateurs who capture an important event with fair and accurate representation. We will discuss ethical approaches to objectivity, the role of the citizen journalist, what to shoot, how to frame, and how to edit. You can focus in-depth on a subject or a wide survey. 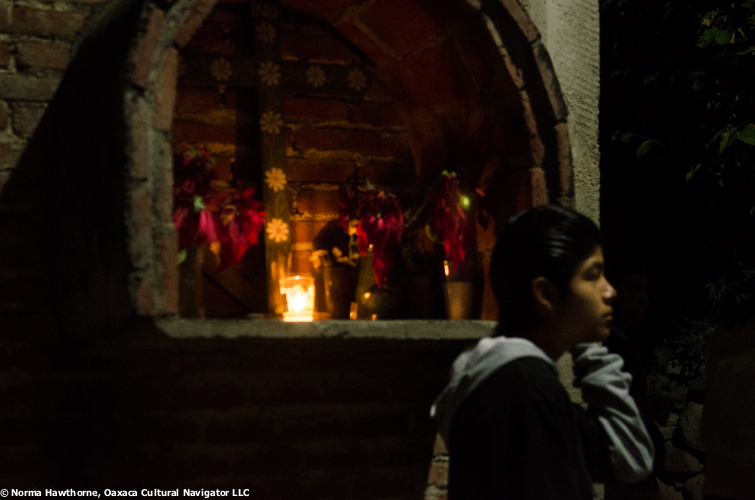 You will build a portfolio of photographs and narration based on these important rituals that combine pre-Hispanic and Catholic traditions. 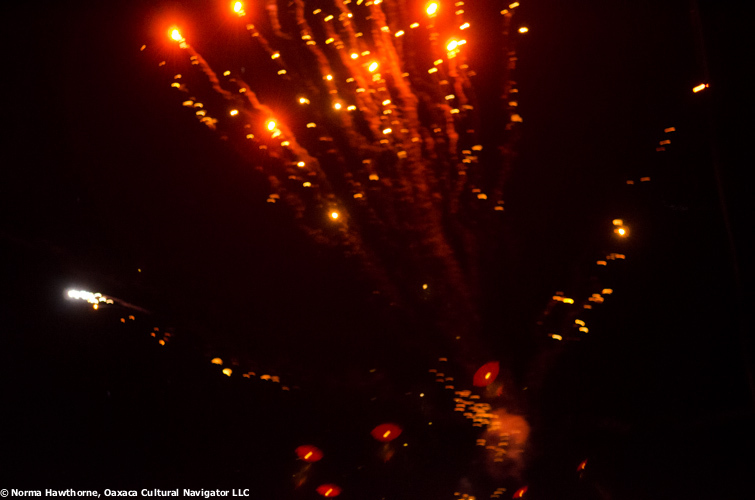 Using the techniques of photojournalism, you will be able to record the visual elements of the celebrations while learning about their significance. JUNE FINFER is an award-winning playwright, photographer, and a producer of documentaries. She studied photography at Illinois Institute of Technology with Aaron Siskind and her films about the architecture of Mies van der Rohe have been broadcast on A&E and PBS. Her play, The Glass House, was produced off-Broadway in New York in 2010. She adapted an unfinished novel by Shirley Jackson, directed by Joanne Woodward for American Playhouse, nationally broadcast by the Corporation for Public Broadcasting. Base Cost: $1195 per person double occupancy with shared bath facilities. 6 nights, 7 days. [ ] Option 1: I will share a room, double occupancy with shared bath, $1195 per person. [ ] Option 2: I prefer a single room with shared bath for a total of $1,295 per person. [ ] Option 3: I will share a room, double occupancy, with private bath for a total of $1,295 per person. [ ] Option 4: I prefer a single room with private bath for a total of $1,495. [ ] Option 5: Add-on a 5-hour Zapotec cooking class, includes local market shopping tour and lunch, on December 31 (arrive on December 30) or January 7 (depart on January 8). Add $110 for cooking class and additional night lodging. If you want to arrive earlier or stay later, we can arrange additional nights lodging in Teotitlan del Valle at $55 per night and additional nights lodging in Oaxaca city at $125 per night (each includes breakfast). Register Today! Use the Registration Form on the banner. Full payment is due to register you for the program. We prefer Payment with PayPal. To get your questions answered and to register, contact: normahawthorne@mac.com or call (919) 274-6194. Thank you. This program is produced by Norma Hawthorne, Oaxaca Cultural Navigator LLC. My friend Annie, known locally as Ana del Campo, lives on the hillside on the other side of the river Rio Grande that runs through town from the presa (dam) throuh the cleavage between two mountains. We came to visit her some years ago and that is how we got to Teotitlan del Valle. 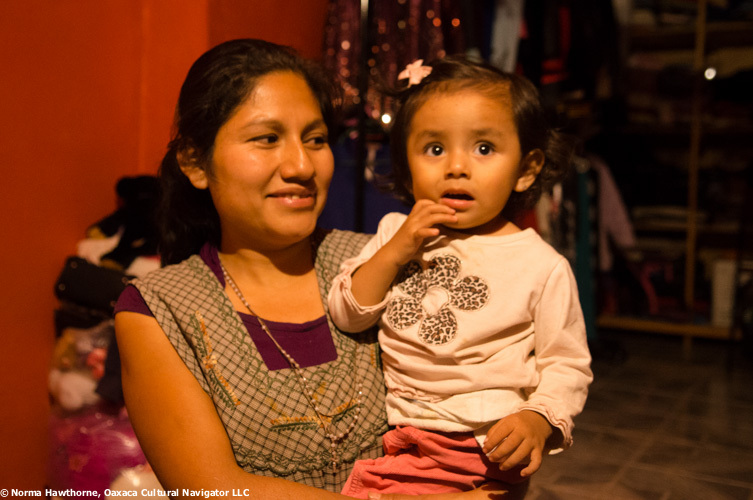 Annie was the second gringa to connect with a local Zapotec family and be invited to build a home on their land. A former psychologist, she is an expert Shiatsu massage therapist and has a loyal clientele in the village and in Oaxaca. One of the treasures and pleasures of coming back to Teotitlan is to enjoy time with Annie, sipping tea, catching up, looking out over the village below from her hillside perch, and then laying down on her mat to give myself and my body over to the expert pressure touch of her hands and fingers in her sublimely tranquil space. This evening was my third massage of the week — a totally relaxing experience, and I feel I can splurge with this expense because the cost is 200 pesos (about $18 USD) per hour. As I walked up the winding rocky drive to her brick and stucco casita, the stars sparkled in the sky and were mirrored by village lights below creating a seamless vision of dancing stars with no horizon. Annie has asked me to visualize who I am in the form of an animal to take as my talisman as a form of meditative relaxation. I am a gazelle, sleek, agile and grazing. Annie tells me that my body will respond and become the form that I visualize. After the massage and to honor my gazelle, Annie makes me a plate full of salad containing at least four different lettuces, fresh grated beets, cherry tomatoes and bright red nasturtiums from Valentina’s garden. This is for grazing, she says. Valentina, who was once Valerie, moved to Oaxaca some years ago from somewhere in el norte and started an organic garden. She sells her bounty every Friday and Saturday at the Pochote Market in the Arcos, just beyond Santo Domingo Church on Macedonio Alcala. Annie sprinkled goat cheese and pecans on the salad and topped it with a homemade balsamic vinaigrette. I followed her lead. This is the ONLY way I will eat lettuce in Mexico — organically grown and washed in purified water by someone you know and trust. To top it off, Annie brings to the table a red tortilla, handmade by Esther (Ess-tare) her neighbor, who ground the village grown red maize herself. Below us, the band is playing its posada repertoire, drum beats, tubas, and saxaphones call out to the night sky. A firecracker rocket is a shooting star. 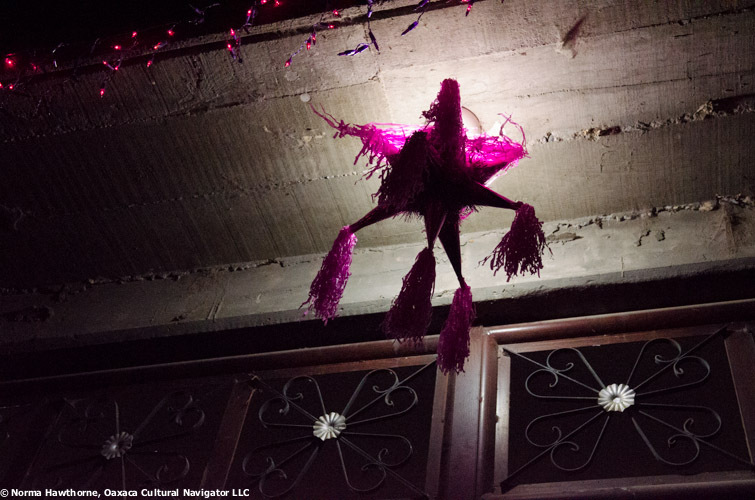 I imagine the tables full of revelers eating fiesta tamales with amarillo mole, downing shots of mezcal followed by beer chasers, sucking limes and salt, dancing the slow Zapotec two-step far into the night, men in one line facing the women opposite them, never touching. The firecrackers pop and the dogs bark in response. The bray of a donkey punctuates it all. Tomorrow, Mary and Joseph will move to another home where the cycle repeats the harmony. Winter holidays – during the Christmas season and through the New Year – are a perfect time to visit Oaxaca (Wah-Ha-Kah). The daytime sun is warming and the evening chill is perfect for strolling wrapped in a hand woven robozo (shawl). Festive, brightly colored cut paper flags hang from the tops of buildings and drape across narrow cobblestone streets. Glorious deep cardinal red Buena Noche (red poinsettia) are planted like a carpet throughout the beds of the Zocalo and adorn the arched entry doors of village houses. 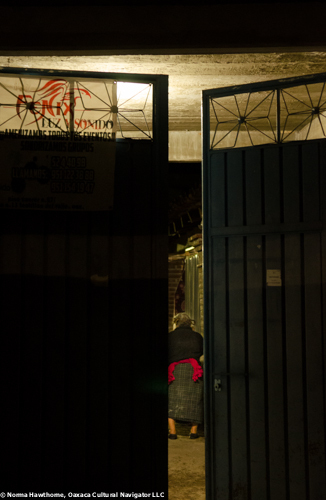 Doorways are draped in ribbon and twinkle with electric lights. 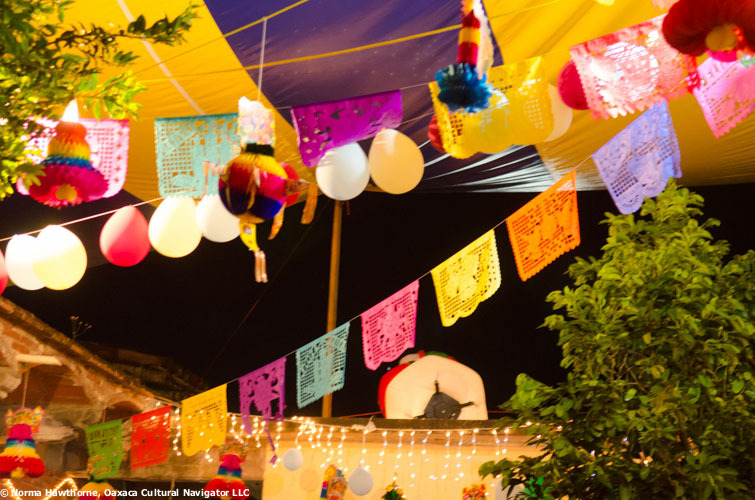 This annual celebration is held throughout Mexico, but in Teotitlan The Dance of the Feather is performed during this day in the church courtyard to celebrate Guadalupe´s anniversary. 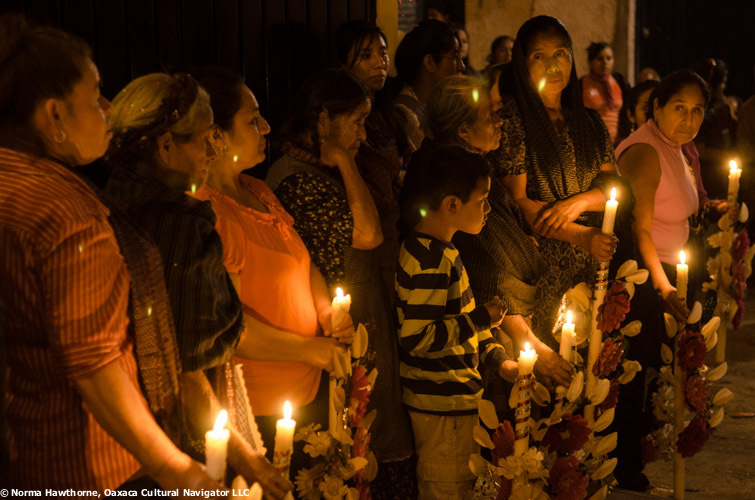 In Teotitlan de Valle, the faithful join daily evening posadas that wend their way through the narrow streets and alleyways of villages, following a band that plays Sousa-like marching music and church elders who carry the Virgin, swinging copal incense and select men and women balancing hand-rolled beeswax candles to light the way. Each year nine families are chosen to host the Virgin Mary on each of the nights before Christmas eve. Each night represents the nine months of Guadalupe’s pregnancy. 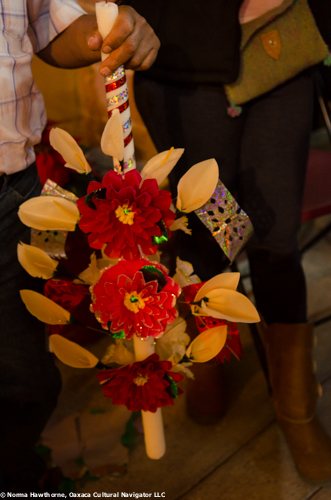 The processionals are led by the hosting family carrying sculptures of Jose (Joseph) and Maria (Mary) through the main streets of the village before delivering them to the next posada house. Each host family invites relatives and friends to celebrate the honor with them, and the revelry continues through the night with songs, prayer, music, food and drink. 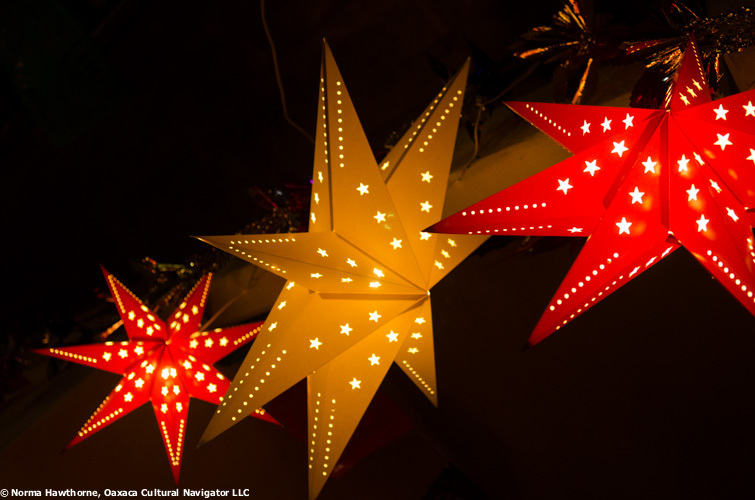 On the last night, the Ultimate Posada (La Posada Ultima) is the most special for the chosen family because they become godparents to the birth of Jesus, who appears in the creche that night to join Joseph and Mary. These are giant red horseradishes grown on farms in the Ocotlan region of Oaxaca, carved into dioramas depicting religious and village life – imagine it and there will be a radish carved to look like it. The lines start to form around the Zocalo at around 4 p.m. and can extend for 12 square blocks. 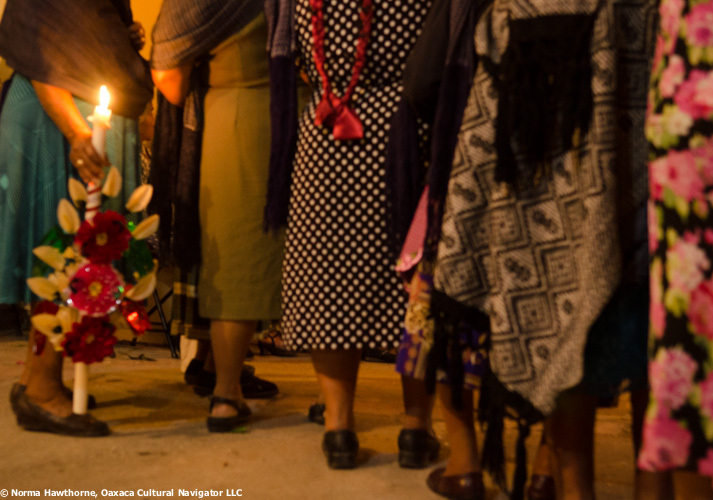 People come from throughout the state of Oaxaca and tourists descend from around the world. The outdoor cafes surrounding the Zocalo are packed and it is difficult to find a seat – squatters arrive early and never get up. People are careful to eat and drink very slowly. There is a raised platform walkway that funnels viewers around the periphery of the staging and display area. Throughout the night, the radish carvers wield big squirt bottles of water to freshen their displays to prevent wilting. The Grand Prize is $10,000 USD! We like to get there early, around mid to late afternoon, when there are fewer people so we are there as the final carving is being done and the finishing touches are put on – a hat placed on a radish head, a hoe fixed with a toothpick into the hand of a radish farmer, a cross tilted to just the right angle in the arm of a radish priest. Last year, we got to the Zocalo too late, and found snaking lines that had no end, so we crossed through the line and entered into the center of the plaza, able to see a rear view of what was going on, craning our necks to get a glimpse of the radish scenes before us. It was fun to talk to the farmers this way. The gold altar of Santo Domingo Church is never more resplendent than it is on Christmas Eve. If you are going to midnight mass, be certain to arrive and get a seat by 10:30 p.m. otherwise it is standing room only in the back of the church. Overflow is outside the church doors in the chill December air. The entire service is in Spanish and it is punctuated with responsive reading and choral music. 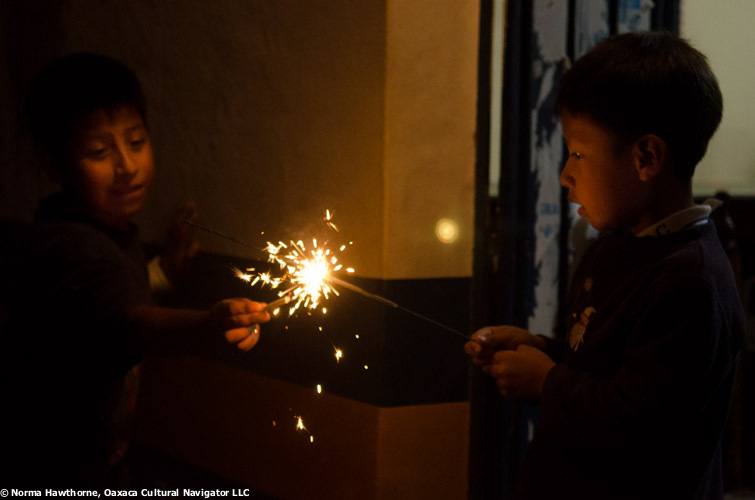 Christmas eve is celebrated in Teotitlan just like everywhere else in Mexico. Yes, this is a day off for the bus drivers, who bring their families with them to the city to ride in the parade. Bus drivers own their own buses, and they come from all the surrounding villages to participate. The buses are festooned with flowers, crepe paper, and all sorts of holiday decorations. Family members smile and wave – they remind me of the floats in the Rose Parade. A posada of buses. A sight to behold. No one works on Christmas day; it is a time to visit with family. Teotitlan villagers walk up to the “pedimento” which they call cuevitas because there are several little caves around this hill. Folklore has it that an image of the Virgin of Guadalupe was found here and it is considered a sacred place. People stay overnight to receive the new year here and believe that if you ask for anything you want on January 1st, it will come true during the year. 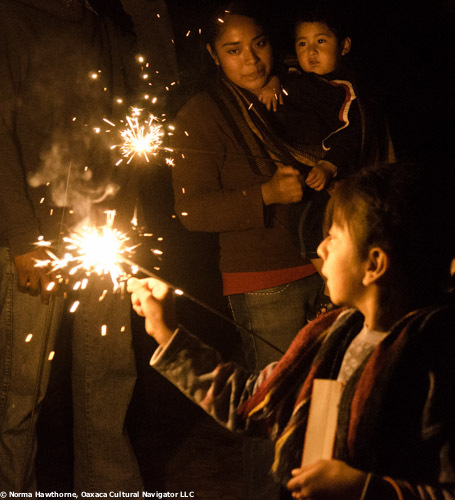 In Oaxaca City on December 31, families usually have a big dinner together to receive the new year. At midnight, 12:00 a.m., they eat 12 grapes and ask for 12 wishes. The entire village goes by foot or car or tuk-tuk (moto-taxi) to the holy area just outside the village in the foothills that is dotted with caves. There is a grotto there to make an offering of prayers for a healthy and happy new year. The tradition is to bring a picnic and gather up stones from the landscape, build a dream house, make a wish, and the dreams will come true. The first year that we went, we were the only non-indigenous participants. In recent years, we have seen more visitors participating with local Zapotec community members in the ancient celebration. I have asked Annie if she would give me permission to publish her letter, which she did, happily. I am sharing it with you. Well, this was a blessed Christmas in Teotitlan del Valle. Your donations rang up to nearly a thousand dollars, which comes to about 11,000 pesos. That goes a long way in a rural village. Plus, 12 brand new dresses arrived for young girls. First, the dresses. I picked them up on Christmas Eve, just in time to get the gift bags under the Christmas tree. My strategy was to place the shiny new bags with tissue paper in them and a Christmas card, but no dress. . . . .just a note instructing the young girls to come to my house to choose a dress. Sure enough, early Christmas morning, Jazmine, Rocio and Esthercita appeared with their empty bags, ready for “shopping”. I left them alone with the dresses and a mirror. After a great long while and much giggling, they appeared in their new outfits. Then Jazmine and I went to Edith’s home and had a nice cup of hot chocolate. Jazmine took Edith and the bag of dresses into another room for Edith’s selection. Edith joined us to go to Cecilia’s home, then Lola’s, Laura’s, Gabriella’s, Mariana’s and El Pidia’s. We were giddy with Christmas spirit. Next, the bano seco, which means “dry bathroom”. I’ll be sending pictures soon, so you can see what it looks like. My neighbors, Esther and Rusio, and their 3 girls are delighted to receive the gift of a bano seco for their family. Rusio is especially proud of the new design that he came up with. It is more efficient and less expensive! The girls will help with the last step in the construction, which involves cleaning the bamboo for the walls. Finally, we have groceries. Lola, who is 10 years old, does not speak more than a few words. She is a happy child, and loves to play with her cousins. You will see her photo in the mailing that I am sending to you. She is a beautiful, smiling child. Her mother, Isabelle also does not speak. We don’t know why. Isabelle’s sister, Lydia, cares for the two of them. Our project will buy groceries for this family once a month. They were filled with gratitude to learn of this, and eagerly made out their list of basic supplies. We will also buy groceries for two elderly couples who are visually disabled. We helped them last year, and want to continue our support. Other good news: Esther, who received a loom last year from our project is now a successful business woman. She is selling her weavings, which she makes into gorgeous pillows. I’m travelling around the USA and Canada this year, and will be selling Esther’s pillows, as well as another weaver’s, Chela. They are both beaming with pride at their new and unexpected income earning potential. Other news from last year’s recipients: Josefina is now the successful proprietor of a Bed and Breakfast, Las Granadas. (Granadas are pomegranites, which are prolific in her patio). Antonia was the hostess for the village posada for Christmas. How do I describe what this means??? She hosted the images of Mary and Joseph on the first of 9 nights in search of an inn for the birthplace of Jesus. It was a beautiful fiesta. Finally, Teresa got married! She and Alex are now living her new husband, who is a musician in a Mariachi group. So, my dear friends, thank you for your gift. It is much more than the gift of money, as you can probably tell by the warmth and joy in the photos I’ll be sending along. They are sending back some amazing smiles.